Vinca major and Vinca minor are evergreen plants that are at home in the woodland or shade garden. 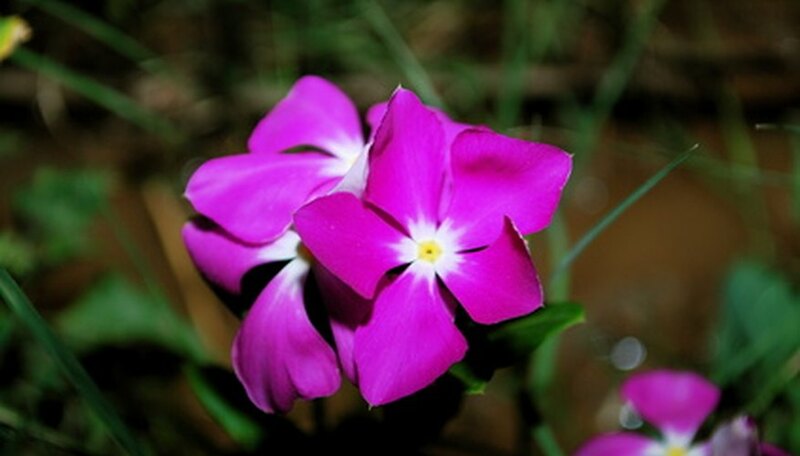 They are nearly identical, but Vinca major is often called greater periwinkle and the smaller version is sold as common, or dwarf, periwinkle. Both have attractive foliage and can be tenacious plants, despite their elegant appearance. Both Vinca major and Vinca minor have long stems with shiny, oval, dark green leaves. 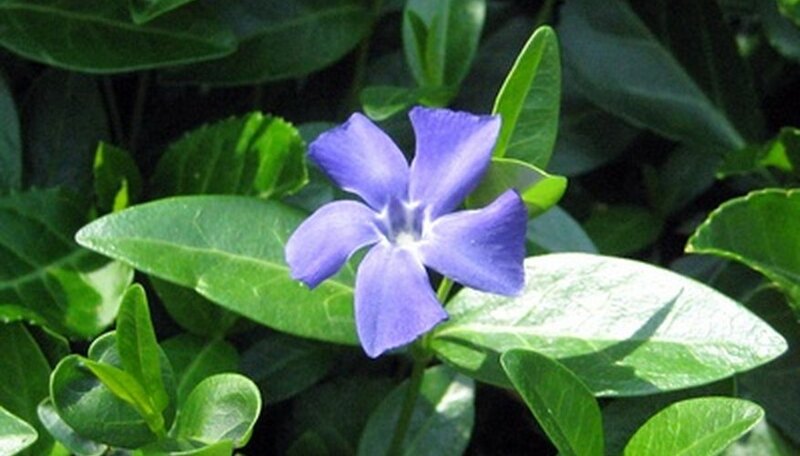 Vinca major's leaves grow up to 3 inches long, while minor's leaves will grow 1 to 1 1/2 inches long. The leaves of both plants grow in pairs along creeping stems and make a thick, effective ground cover. There are two types of stems: rooting stems and stems that produce blooms. The rooting stems produce only leaves and will root wherever the stem touches the ground. The blooming stems produce simple, blue flowers. Both varieties bloom best in spring, but will produce sporadic blooms throughout the summer and often have a second flush of blooms in cooler fall weather. They produce fewer blooms when planted in deep shade. Vinca minor "Atropurpurea" has the same form as common Vinca minor, but the flowers are ruby red. Vinca minor "Alba" produces white flowers. Leaf color also has variety. Vinca minor "Aureovaiegata" has lighter blue flowers, but yellow and green leaves, while "Argenteovariegata" has leaves that are white, gray and green. Vinca minor "La Grave" will form clumps and has the same bright blue flowers of the dwarf periwinkle. Vinca major "Variegata" is a popular variety of greater periwinkle, with green and white leaves. Both varieties prefer rich, moist soil, but they will do well in average soil with moderate water. They adapt easily to many conditions and will grow in full sun as well as in deep shade. However, in areas with hot summers, Vinca should be planted in partial shade. An established Vinca needs only the occasional trimming to keep the creeping, rooting stems under control. They are not bothered by many pests. Vinca minor will grow well in most climates and is a dense ground cover for shade where other ground covers fail to thrive. It also is effective on slopes, where its rooting stems will prevent erosion. Vinca minor takes light foot traffic, and winds its way around stepping stones. It can cascade over a terrace or retaining wall. Vinca major is also effective in these situations, but may be more invasive in shaded areas. Its stems also tend to grow upright before trailing outward, creating a mounding effect. Both varieties are invasive under the right conditions. In shaded, moist areas with rich soil, Vinca major and Vinca minor will spread vigorously, sending rooting stems around or through other plants. These stems are not bothered by root barriers and will quickly take over an entire planting bed. The stems can also reach across narrow borders or edging, creeping into lawns or neighboring gardens. 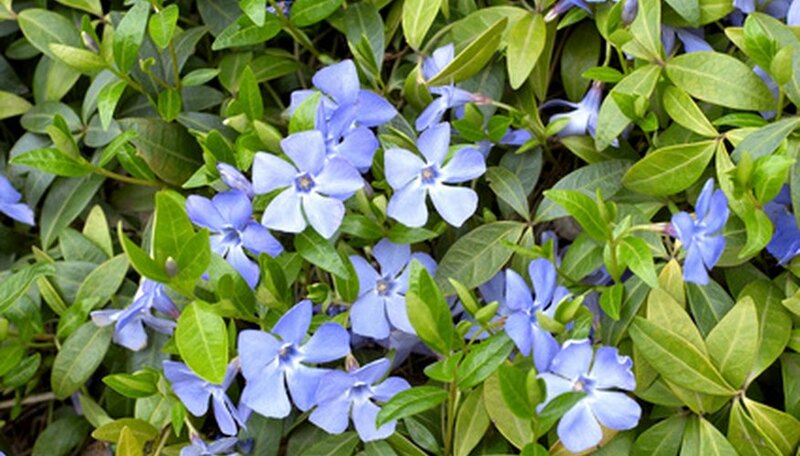 Periwinkle should be planted where wide barriers, such as driveways and sidewalks, will prevent their spread. Some states have listed Vinca major as an invasive weed. Tennessee lists both as invasive. Is the Ranunculus a Dicot?